At last, I got to cook Dinuguan (Pork blood stew). I’ve been wanting to eat and cook dinuguan since I got to Singapore and that is almost 4 yrs already. Only last Easter Sunday was I able to fulfill that :D Well, I never had the chance to cook this dish when I was still in the Philippines prior to relocating to Singapore. Talking about procrastination, complacency, and uninterest in something I so often see or is always available. Most of the time, it's all about plain laziness. It happens, so when something is scarce and beyond my reach, I look back with regrets to the missed opportunities in the past, and ask myself “why did I not try cooking Blood Stew / dinuguan when blood is available and plenty”. Dinuguan (dinardaraan in Ilocano) or blood stew is a popular dish in the Philippines in which the major ingredient is animal blood, and meat and / or innards and entrails. 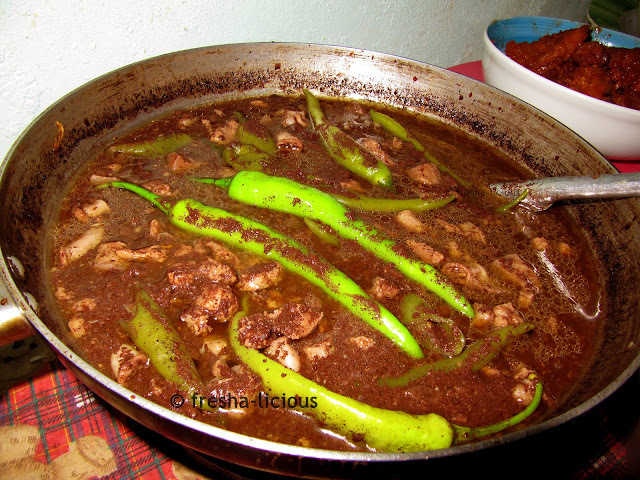 The name dinuguan come from the word dugo which is the Filipino word for blood that is also called as dara in Ilocano. 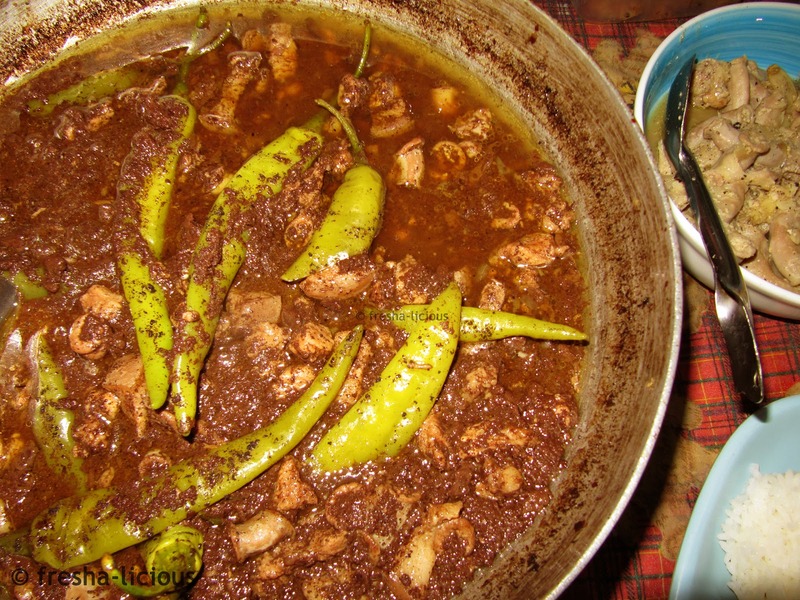 This dish may seem to be appalling and distasteful specially to the squeamish or may even be repulsive and offensive to other people due to cultural or religious beliefs, but for the Filipinos, this is one tasty dish that is a must-try for foreigners. The dish may be made of blood but it doesn’t have the nasty-metallic taste associated with blood. The blood stew flavor is actually rich and savoury, in short, delicious, specially when combined with spices. The taste ranges from salty-sweet-sour or salty-sour-spicy depending on how it’s cooked, what ingredients specially what meat or parts of an animal (pig, chicken, cow, goat, etc.) was used. For me, I prefer the dry-oily type which is salty-sour, that’s how my Papa Ambring cooks his dinardaraan. My Mama Tessie’s version tastes salty-sour but is usually soupy. For some Filipino’s, depending on where they come from, will cook it with coconut milk for a smoother and creamier sauce, some people add vegetables like sayote or green papaya, some use meaty parts only, and some prefers the innards and entrails, or a combination of both. Which ever way one wants to cook it, dinuguan / dinardaraan will still be one of the best Filipino dishes that can be served as a viand and goes with steamed rice, or as a snack and is eaten with puto (steamed rice cake), or pulutan that is wolfed down with ice-cold beer or ginebra gin. Freaked out? Why should you? It's not like we're eating raw blood and it's not like this is news to anyone. 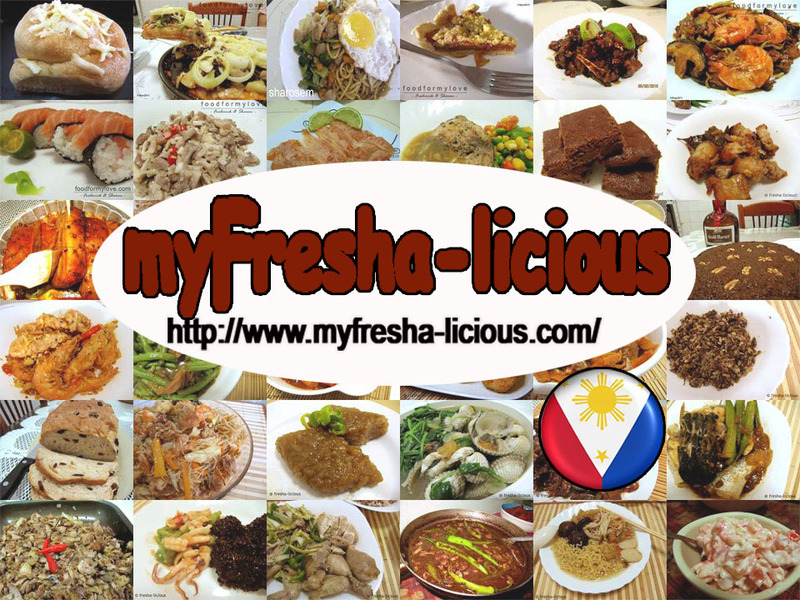 Cooking with animal blood is not only peculiar to the Filipinos. In fact other cultures from Asia, to Europe, to America has their own dishes using blood as the major ingredient. The Chinese, for instance, has red tofu referring to steamed coagulated blood and they also use blood as ingredients in other dishes. 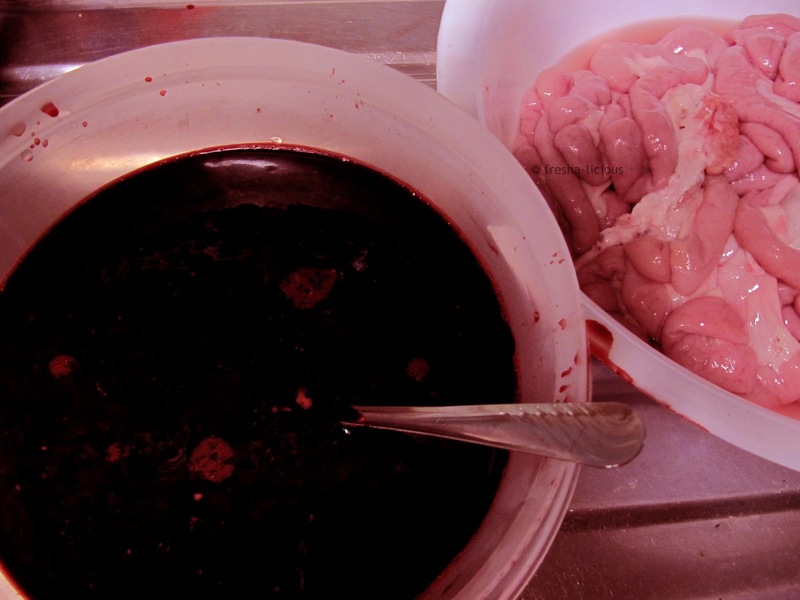 The Tibetans’, Gyuma or blood sausage, the Taiwanese pig’s blood cake, the Korean’s Sundae (Blood pudding), and the Thailanders’ sai krok lueat, all make use of blood as ingredient. Swedish - blodkorv (blood sausage), blodplättar (blood pancakes) and blodpalt. There is also a soup made from blood, called svartsoppa (black soup). Pig's Sweet Intestines - 500 g.
Heat the oil in a pan and sauté garlic until it almost turns brown, add the onion, then the meat. Pan fry it until the liquid and oils from the meat comes out. Transfer the meat into a pressure cooker. Add the water and bring to a boil under pressure for at least 20 minutes. Release pressure from the cooker and open lid. Add the blood and the seasonings and let it simmer until most of the liquids have evaporated. Add the green chili and simmer for another 2 minutes. You can serve it with rice for dinner or steamed rice cakes (puto) for snack. I really love Filipino food especially dinuguan. It's always like a fiesta every time we have a vacation in the Philippines.